Each time a student signs an official Letter of Intent and commits to joining a Concordia University Ann Arbor athletic program, the excitement of a new opportunity to become part of a team committed to developing in mind, body, and spirit is palpable. On Dec. 12, the Cardinals softball program signed a significant new program addition, and the team is especially thrilled to welcome their newest teammate, Carly Fraser. The 13-year-old Fraser, of Redford, Michigan, was diagnosed in 2004 with Turner Syndrome, a genetic condition with a range of health concerns caused by the absence of all or part of the second X chromosome in some or all of the cells of the female body. CUAA’s softball team partnered with Team IMPACT, a national nonprofit that connects children facing serious or chronic illnesses with college athletic teams, forming life-long bonds and life-changing outcomes. Throughout the journey, the child gains strength, camaraderie and support while the student-athletes experience lessons ofcourage, resiliency and perspective they can’t learn in a classroom. In the midst of Concordia’s finals week, the entire softball team gathered on Wednesday afternoon to celebrate with Fraser and her official signing to become the 32nd member of the team. 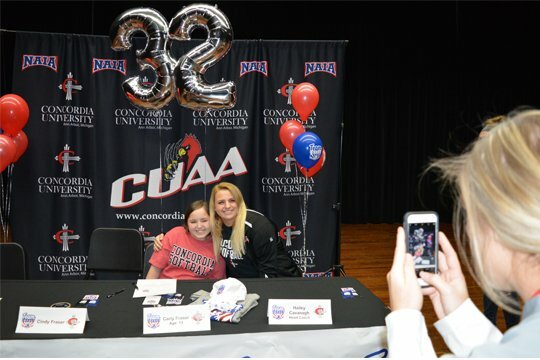 After Fraser signed her name—her nails painted in Concordia red and black—the group celebrated with team photos, cupcakes and cookies, and a cake decorated with the number 32. With a wide smile fixed on Fraser’s face throughout the celebration (even after a photo with each and every teammate) she shared that “meeting everyone” has been the biggest thrill of becoming a part of the Cardinals softball team thus far. Since 2011, Team IMPACT has matched more than 1,300 children with more than 500 colleges and universities in 47 states, reaching over 35,000 participating student-athletes. The child joins the athletic team and the student-athletes join the child’s support team. Fraser’s support team just became a whole lot bigger. The Cardinals softball team will begin regular season play in spring 2018, and Fraser will be alongside them for the entire season. Fraser will take the mound in her very own Concordia Cardinals jersey with a team of support rooting her on from the first base line, just as they will root her on through her battle with Turner Syndrome.